You are currently browsing the tag archive for the ‘masculinity in times of conflict’ tag. Three months in this place does what to a human being? There’s no doubt that December is the month of looking back, scanning the year for highlights, the things that have mattered. For me, one of the highlights (amongst many) was my three-month time as Creative Fellow at the Australian Defence Force Academy via the generosity of the University of NSW Canberra. I was in-residence at ADFA from September to November, and it’s no exaggeration to say that I loved every minute of it…even though, for the first few hours, I sat in my bare white office in the Academy Library and thought, Oh my, how on Earth did I end up here? I remember earlier this year how I’d read through the application details and quickly concluded that a military environment wasn’t exactly the right fit for me. Twice now I’ve protested in the streets about Australia’s involvement in military conflict overseas. Frankly, I’d rather see the defence budget reduced and money on education and the arts – including education in the arts – increased. And then there’s the simple fact that I’m just not interested in the machinations of war: the machinery, the strategy, the winning at all costs (and what terrible costs they almost always are). However, it was said to me that if I was feeling uncomfortable about being in the military environment then perhaps that’s exactly where I should be. 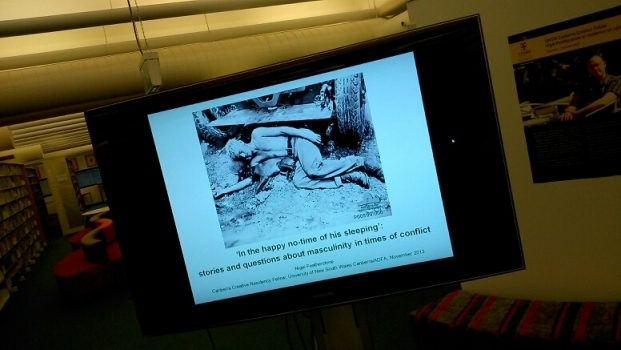 So I started working on the application and soon found that I was interested in definitions of masculinity – how are men truly and perhaps profoundly tested in times of extreme conflict? Needless to say, it was a complete thrill to be awarded one of the two residencies on offer, and as the time came closer I became more and more nervous. Really, was this the right thing for me to do? And the question was turned up to eleven on that first day in September when I sat in that bare white office in the Academy Library. Eventually I decided that I wouldn’t approach my research through philosophical or academic lenses. Rather I’d simply expose myself to as much material as I could find amongst the extraordinary resources available (the ADFA Academy Library is known to have one of the world’s greatest collections of military material): fiction, non-fiction, poetry, feature film, documentary; I also had some fantastically energising conversations with UNSW Canberra academics. End-of-residency presentation day: just off-screen is your local Nigel Featherstone shitting himself from nerves. One of the things I found very interesting about being ‘in residence’ at an academic institution, in contrast to other residencies I’ve been on (for example, Bundanon, Cataract Gorge, Varuna), is the feeling of connection to the topic, as opposed to being in delicious isolation (which, at the right time, has benefits). 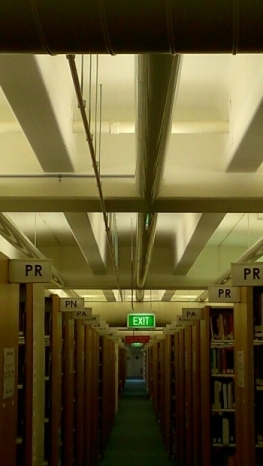 On the ADFA campus I was constantly surrounded by material, and it wasn’t only the material in the Library – even going to get a coffee got the thoughts flowing as I was almost always surrounded by men and women in military dress. It all added up to a very stimulating and thought-invoking time. So, for three months I filled my brain with stories and observations and conversations, and some questions evolved. Who is a man? Who is a good man? Who is a good person? Who is a good being? And then other questions came to the surface, questions about fact and myth, how nations tend to love the latter for not entirely malevolent political reasons. I don’t have the answers, of course, but I’m looking forward to continuing to think about these questions and see what original work might result over the coming months and years, decades even. Have my views towards the military changed? I’m not sure they have, but I do feel as though I have a better (though, in the broader scheme of things, still cursory) understanding of Australia’s military history, and perhaps a deeper appreciation of what service men and women go through to achieve strategic goals. I still consider the military mechanism for resolving differences completely and utterly barbaric and absurd. But perhaps I’ve been given a touch of insight into the humans beneath the camouflage, and, more or less, there’s a diversity to people who have served and who are currently serving. When Australians think of their military history, they might always conjure the larrikin ‘Digger’ in his slouch hat. But that larrikin ‘Digger’ in his slouch hat is not all there is to it. And that larrikin ‘Digger’ might not even be true. Much gratitude to UNSW Canberra for the opportunity, and thanks to the staff for being so helpful and welcoming.